If you plan to buy a new computer in the coming months, the immediate question in your mind is - Should I purchase a powerful PC with Windows XP and later upgrade to Windows Vista or postpone my purchase and wait until January 2007 when Vista hits the retail market shelves ? Buying a computer that is pre-loaded with Windows Vista would make things much simpler. 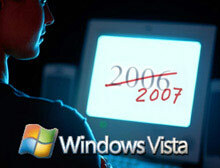 But even though Microsoft has promised that Vista would be available in early 2007, most of us are already aware that Microsoft routinely misses promised release dates. Therefore, my advice is don't wait for Vista. Go ahead and buy a new PC with Windows XP. Vista would require a fairly high end system to run smoothly. Since you may want to upgrade XP to Windows Vista OS later, make sure that your new computer already meets the Windows Vista Hardware requirements like have lots of RAM, install a separate graphics card with atleast 256MB of RAM, get the latest Pentium Processor (better, get x64-compatible chips) and a really huge high-rpm hard-disk drive. Luckily, all the hardware components that are required to get the best performance and visual effects from Windows Vista are already available in the market. ATI's Mobility Radeon chipset is good enough to display the Windows Vista Aero 3D-desktop. Even the NVIDIA GeForce GPU series have been declared as "Windows Vista Ready"
The entire x64 processors from Intel and AMD will be excellent processors for Windows Vista. The latest Intel Core Duo processor for Laptops is perfect for Vista. For desktops, the Intel 945G Express Chipset is Microsoft Windows Vista ready already. Choose the right Windows Vista version | Windows Vista could boot computer sales | Windows Vista Problems | How to Ensure New PC Can Use Windows Vista | Buy a new PC or Wait for Vista | When buying a new PC, keep Vista in Mind | Centrino Duo: Buy or Wait ?